All the stronger for taking time to produce this sophomore, Sons Of Alpha Centauri have moved a long way forward from their Stoner instrumental beginnings. Instrumental Progressive Rock. Not always the easiest of listens, granted, but, as Kentish band Sons Of Alpha Centauri ably prove, it is often one of the most rewarding. Describing themselves as Alternative Trance Rock and refuting the notions of any 'Post' tags, and, for that matter, any other lazy accusations of being Metal, they blend the Classic Rock of the 70's with a liberal dose of modern electronica. Overall, it's a pretty lush result, it has to be said. 'Continuum', their sophomore LP, is released nearly eleven years after their initial full length. But, whilst all that might sound a tad Axl Rose, it actually belies the band members continuing creativity and numerous other outputs. Anyway, as they say, 'Continuum' is where they finally grab the bull by the horns, being as it is both a considerable musical step away from their Karma To Burn-tinged Stonerish beginnings, and an even larger one in overall concept, design and production. 'Into the Abyss' pulls the cutain back in suitably cinematic fashion and heralds the majestic groove of 'Jupiter'. Bass throbbing beneath spacious guitar chords and the fairly consistent umbrella of Sci-Fi infected keyboards, the music itself suggests the visual awe of a weightless approach to the atmosphere and moons of our solar systems largest planet. 'Solar Storm' is a suitably upbeat Space Rock venture, showcasing the bands obvious ability to craft seamless structures within their songs, the likes of which are both progressive and yet wholly accessible to the ears. The album is as good for pure listening pleasure as it is thought provoking and absorbing. With all that said, the best things come to those who wait, and the closing two numbers are both lessons in restraint and simplicity, as well as knowing when to let loose and throw everything at the wall. 'Orbiting Jupiter', with its Philip Glass tonality, is a brief but perfectly formed intro to the closing ramble of 'Return Voyage'. The track itself builds patiently with subtle effects and nuance to a pummeling crescendo, bringing to mind all manner of historical space and rocket footage where things aren't exactly going according to plan. By the end though you get the feeling of a safe return even if those returning have been irrevocably changed by the somewhat harrowing experience. 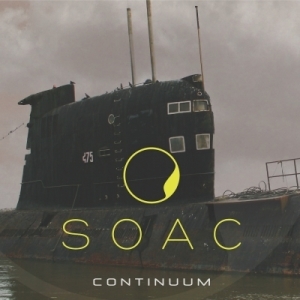 'Continuum' is a good example of a band moving forward, and confidently honing its craft. By focusing on the overall concept, and sticking to it, they've helped to cut themselves adrift from the lazy musical comparisons they garnered in the past. Attention to detail appears to have been paramount for this recording, and the pay off is a handsome one. Especially as far as the production goes. Compare it to earlier releases. Sometimes you have to outgrow your place of origin in order to survive and find wider acclaim as well as deeper meaning. It looks as though 'Continuum' has done just that for the Sons Of Alpha Centauri.